Gameloft make no attempt to disguise the fact that their Modern Combat series for mobile devices is inspired by the Call of Duty franchise. 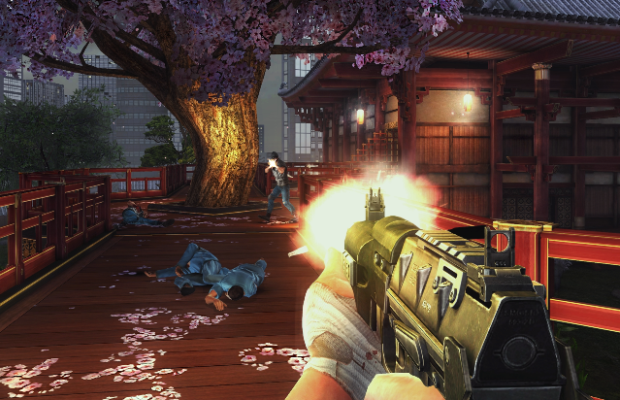 The Call of Duty series has never managed to make a mark on mobile devices, but Gameloft have tried to adapt the fast-paced, action-packed gameplay of Activision’s flagship title and condense it down for mobile phones and tablets, and perhaps piggy-back off the success of the Modern Warfare series a little at the same time. You are thrown straight into the action, with a tutorial flashback mission set in Venice. Characters aren’t properly introduced and the game constantly references past events in the series – which isn’t great for players looking to pick up a Modern Combat title for the first time, although story is rarely the most important feature of an FPS. 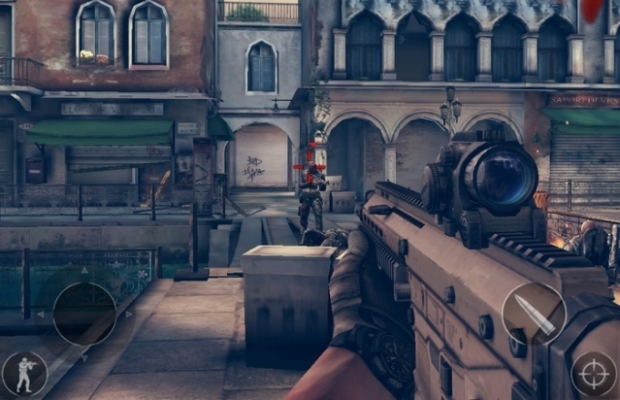 We see straightaway that Modern Combat 5 is going to be a linear affair, but this seems intentional to reduce the difficulty of touchscreen controls, and to enable the scripting of dramatic action set-pieces. That is what the title does well: it takes the over-the-top explosions and collapsing buildings that punctuate the Call of Duty series, and squeezes them successfully onto the smaller screen. Each single-player mission is fairly brief – mostly delivered in five minute chunks – making it perfect for jumping in and out of and playing in short bursts. Gameloft have obviously attempted to tailor the missions to suit the platform – most gamers on mobile devices are looking for a short, quick fix, and that is what Blackout delivers. You won’t be stuck doing the same thing over and over for too long, either: there are a selection of vehicle-based missions, sniper sections and more that add some variety to proceedings. There is little freedom in the missions, though, with most guiding you along a set path almost automatically – although this makes sense when there are obvious limitations in the virtual joystick controls. Moving around feels slow and unresponsive, and swiping to turn and look around is also tricky. Just facing yourself in the right direction can be tough at times, and you will often find yourself firing your gun when you just wanted to turn your head. There are a variety of control set-ups to try – but these only change minor details, such as moving the location of the second virtual analog stick, or removing the fire button, making the whole screen the active area for tapping to fire your gun. These all end up feeling more or less the same, and don’t really help matters. A gyro option for looking around might have been useful, to allow for quicker re-positioning of your aim. Thankfully there are aim, sprint and crouch assists to help take the pain out of navigating, while letting you concentrate on the action. This makes the gameplay seem even more automated, but Blackout is at its best when it’s closer to an on-rails shooter, holding your hand as it shows you exactly what the developer wants you to see. And what you see is fairly impressive, looking and sounding very polished for a mobile title. Aside from the short campaign missions, there are also Spec Ops missions and Breach mode. Breach mode is a mix of Terrorist Hunt from Rainbow Six: Vegas, and Virtual Cop. You and an AI partner travel through a series of rooms, clearing them of bad guys. Each has a different colour above their head, signifying that you can only kill them with a specific tactic – i.e. a headshot. 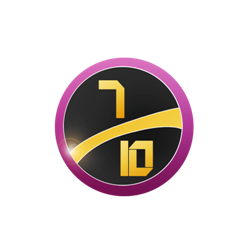 Spec Ops is a series of micro-missions, tasking you with completing certain challenges within an allotted timeframe. These are even more bite size, taking no more than a minute each. The final option is online multiplayer – which can be played individually or as part of a squad of friends. The fast-paced action found in single-player doesn’t work quite as well in multiplayer, as the levels lack any of the set-pieces or tight focus that make it work. The multiplayer feels like it was developed quite separately from the main game, and is a far slower and relatively basic affair. Lag didn’t present itself as much of an issue however, and gameplay was always fairly smooth for the short amount of time that I actually managed to stay alive. 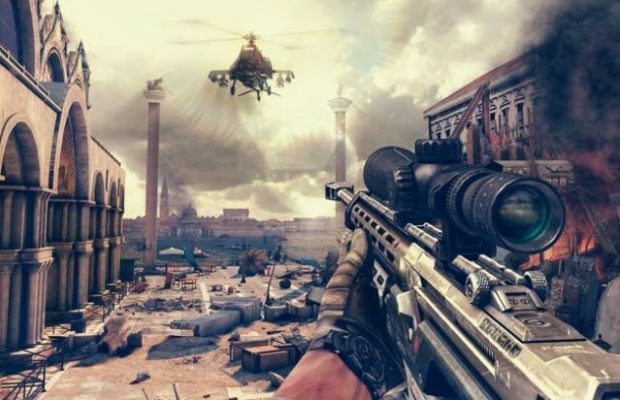 VERDICT: Modern Combat 5: Blackout works best when it is allowed to be an on-rails shooter – providing a highly polished, action-packed campaign that’s easy to dip in and out of. The multiplayer mode does feel tacked-on, though, and slightly disconnected from the rest of the game. A few more stages of the main campaign would have been preferable over a multiplayer mode that doesn’t fully deliver. Blackout is as linear as first-person shooters get, and the control method is poor to say the least, but as a casual title it provides surprisingly epic shooting action.